And just like that, we were headed to LACMA. Little did he know the bonus for me was going to the Bing auditorium to see the encore viewing of Christian Marclay’s, “The Clock”. “The Clock” is a 24 hour mega montage of movie clips depicting various scenes featuring time-there are alarm clocks, grandfather clocks, watches cuckoo clocks, sand dials and other symbols all meant to evoke time passing. The work is in real-time so viewers in the theatre at 9:01 a.m. are seeing events taking place on film 9:01 a.m. Intriguing concept. How do the donuts fit in? To be honest, I’m still not entirely sure, but they served as a convenient ruse to get my husband to come with me to LACMA on a Sunday morning. 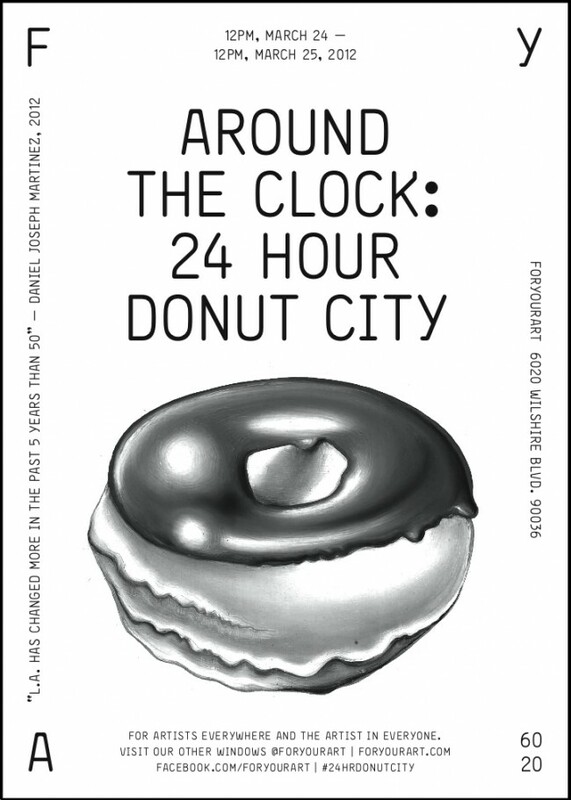 For Your Art graciously gifted free donuts for a full 24 hours coinciding with the screening of “The Clock”. The best donuts of LA were carefully selected and distributed to hungry Angelinos on the hour. These guys had me fiending for donuts since last week and I only eat these donuts once or twice a year. 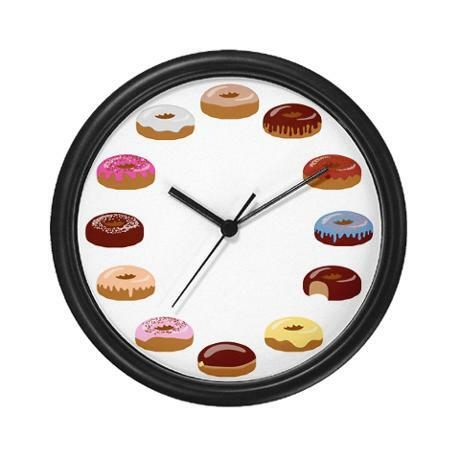 It all started with a published donut “schedule” on their site and the Twitterverse was abuzz with visions of sugar, sprinkles, strawberries, maple glaze and bacon. Perhaps it was a lack of caffeine and the early hours, but the donut mania I was expecting appeared to have subsided. There were lots of drawings of donuts on the wall in the narrow space used for the exhibit and a brief explanation of the purpose on the wall. By this morning they had given out over 2,000 donuts. Their site is incredible, I wished they had publicize their mission a bit more. Nevertheless, I was grateful for the clock watching fuel so we ended up saying our thanks and took our donuts “to go” for the screening. The Clock was fascinating in its concept, but after 20 minutes the novelty quickly wore off (or maybe it was just a sugar crash). We were there at 9:00 a.m., so the movie clips were an interesting montage of people waking up and businessmen starting their day. The piece deftly ties together similar themes from the film clips and Marclay’s use of musical scores transitioned the vignettes seamlessly. For movie buffs, this movie mash-up will evoke fond memories, but does this transcend entertainment? We pondered that question as we drove home. As a Gold Lion winner at the 2011 Venice Biennale I must admit I expected more . I left with a sincere appreciation of the herculean efforts Marclay took in editing and directing this piece. Beyond the technical expertise, I cannot comment much more beyond that other than that it was entertaining and captivating. I couldn’t imagine spending more than 2 hours watching it (our stint was less than an hour). Unless you are an actual editor, producer or a film student I don’t see why anyone would devote that kind of time to it. As I looked around the auditorium it was apparent that there were people who had been in that theatre overnight. (You didn’t have to LOOK around to tell that people had been there overnight also, if you catch my drift). I digress. Maybe I didn’t given it enough time, but when it comes to art I have learned that if I don’t have a connection to the piece I move on. If the Clock taught me anything it’s that time is precious.